It is almost scary to look at the ingredients listed on the majority of our home products. You would be hard pressed to find something you can actually pronounce, let alone recognize. I feel the most comfortable when I use products that are made from resources that I can easily identify, and the best way to ensure that is by making them yourself. This way you know exactly what is going into the items you are using, which can be especially important when there are small children in the home. I know, it might sound a little over-the-top to start making your own cleaning agents and home supplies, but the truth is that most of these items do not require more than a few ingredients. Think of it in terms of making dinner for your family, take-out is nice every now and then, but sometimes it’s the healthier and more affordable option to have a home cooked meal. That same mentality goes into making these DIY goods. They are made from familiar, safe ingredients, are cheaply made and they get the job done. 911 Restoration is dedicated to helping their community make healthy, safe choices, so we have made a list of some of our favorite do-it-yourself home goods to get your started. Wood cleaners can be quite expensive, and if you are trying to cover a large surface area, it could end up costing an arm and a leg just to spruce up your cabinets. This tried and true recipe will take away the scratches and imperfections almost like magic, and all you need are two ingredients. Mix together 1 part white vinegar with 3 parts olive oil and you have yourself a DIY wood cleaner. Use a soft rag to rub it into the effected wood and watch the marks disappear. With all the pesticides being used on fruits and veggies it is important to wash your produce thoroughly before eating. Giving them a good rinse used to be enough, but now many of chemicals used can really stick to the food. 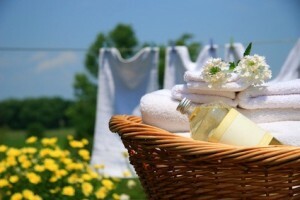 You can buy sprays and washes that are meant to help remove all the gunk, but those products can be pretty costly, especially if you are using them all the time. Making your own produce cleaner is a more affordable option that is super easy to make. 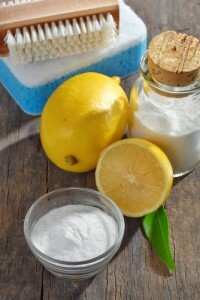 All you need is 1 tablespoon lemon juice, 1 tablespoon baking soda and one cup water. Pour it all in a spray bottle and shake before each use. This is one of those staple products we always seem to need. They can cost close to $6 a bottle if you are trying to buy the eco-friendly brand, which can add up when you are spending that on something you use all the time. Making your own glass cleaner is a fraction of the price and it works beautifully. To make a gallon of the stuff, combine a ½ cup of ammonia, 2 cups of rubbing alcohol, 1 teaspoon dish detergent and water. Just pour all the ingredients in a gallon jug and fill to the top with water. Transfer in a spray bottle as needed. Store bought bug spray is riddled with harsh chemicals. To me, it just feels like you are inhaling toxins that cannot be good for you, so I use to choose to stay away from the stuff completely and, instead, take my chances with the bugs. However, now with homemade bug repellent, you can be confident you are putting something on your skin that is actually good for you. The best concoction consists of about a cup of water mixed with 14-20 drops each of citronella and purification essential oils. The easiest way to apply it is by using a small spray bottle, making sure to shake before each use.